Avengers: Infinity War introduced viewers to Thanos’ ship, the Sanctuary II, but could this ancient vessel actually be tied to The Eternals? 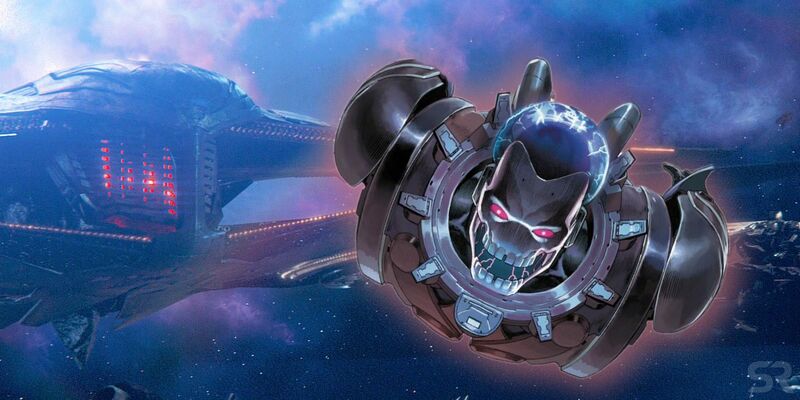 Marvel has always insisted that everything’s connected, and quotes from the concept artists for Avengers: Infinity War suggest this vessel may a lot older than audiences first thought. Sanctuary II was first seen in the post-credits of Thor: Ragnarok; rhe God of Thunder had decided to take the Asgardian refugees to Earth, and insisted to Loki that everything was going to turn out just fine. Moments later, the refugee spaceship was dwarfed by the ominous form of the Sanctuary II. It didn’t take Marvel long to confirm that this was Thanos’ ship, and that the Mad Titan had come to claim the Space Stone from Loki at last. Needless to say, Thor’s belief that all would be well turned out to be very much ill-founded. The Sanctuary II returned in Infinity War, but if only for a brief time. And now there’s new information on what went into its design. After all, everything about Thanos is defined by what he saw happen to his people; he uses their fate as justification for genocide, and he’s even made Titan his base of operations. It would be entirely in-character for Thanos to be flying around the galaxy in one of his people’s ancient ships. If that’s the case, then Sanctuary II may be far more important to the MCU than viewers first believed. In the comics, the planet Titan was colonized by a race known as the Eternals. They were an evolutionary offshoot of humanity created millions of years ago – and, significantly, Marvel is currently working on an Eternals film believed to bet set millions of years prior to the MCU’s Phase 1. The Eternals could well serve as a prequel film for the entire MCU, even showing how Titan was first colonized. If Sanctuary II does indeed originate from Titan, then it’s a hint as to the kind of philosophy and mentality that drove the Eternals. Particularly interesting is that sense of balance, which, in the comics, is typically associated with the Celestials – a race the Eternals worshiped. Thanos, of course, has inherited his own twisted and insane version of the idea, and uses it to justify his atrocities.